We don't always make video calls from well-lit rooms or out in bright sunlight. Sometimes that call is going to happen from a dark concert venue, a poorly lit office, or just as we're lying down to sleep. If the scene is dim, the video quality is bound to be noisy and show almost zero detail. Despite Google's prolific reputation for working magic with the camera on Pixel phones, that doesn't mean Duo can apply all of those same tricks on videos, or especially with every device people might use. It looks like the Duo team is working on a Low Light mode that will work a little bit of illusion to up the quality of videos to bring back a little bit of the image. The only things really made clear in the text is that Low Light mode will be accessible with a button, which I imagine will be shown right on the call screen along with the buttons for muting and hanging up on a call. I am left with a couple of other observations. The first is that the text doesn't give any details about how the image is being adjusted or processed. It's possible this is just dragging up the exposure level of the overall image. This will certainly help, but I would like to think this is benefiting from some of the experimentation that was done a year ago that began with custom settings for color effects, exposure compensation, and white balance, then moved on to brightness, contrast, and saturation. And those may be the tip of the iceberg, and there may be special processing to highlight edges or add emphasis to peoples' faces. My other comment is about who controls low light mode. It's notable that you only control Low Light mode on your own camera. However, in many cases it's the other person that will notice that the scene is too dark and will have to ask you to take action to enhance the image. There certainly are reasons why this option should remain with each distinct person on the call, but it seems like a strained calling experience if the person seeing the image can't do more to fix it. 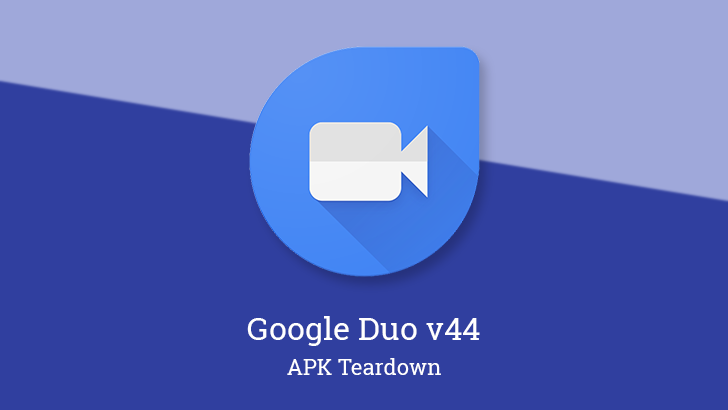 In the Duo v43 teardown, elements of a new Data Saving mode began to emerge. As you would predict from the name, it scales down the video resolution for everybody on the call for the sake of conserving data. This will be useful for anybody on a cellular or metered Wi-Fi connection. In the latest update, some new text adds further details about feature and a couple of its nuances, and most of it is summarized in a single line. In short, it explains that Duo already scales back on data usage over mobile networks, but the Data Saving mode will go even further and points out that it replaces the old Limit Mobile Data Usage toggle. The phrasing also explicitly points out that this applies to both mobile and Wi-Fi connections. To reduce confusion, there are also a couple messages that will appear to let you know if your own device or another member of a call has Data Saving enabled. Naturally, Duo shouldn't be blamed for poor call quality when it's actually enabled on purpose.